Officer Mike Rinaldi stands amidst a throng of white dudes he definitely won’t arrest. 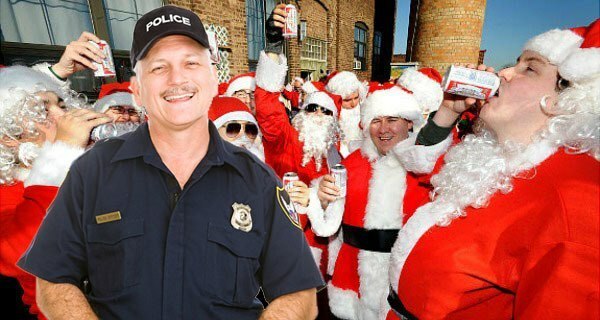 As New York gears up to celebrate its 19th annual SantaCon festival, the often trigger-happy NYPD prepares to do absolutely nothing in the face of the debaucherous mayhem. Over 350 other cities across the globe will join NYC by hosting their own SantaCon festivals, and while the particular customs and events differ greatly, their respective police forces remain hearteningly unified in a common goal: not arresting any white people whatsoever. This is a staggering increase from the location that formerly kicked off the festival—the Lower East Side—home to less than 7% black residents.